Ho Chi Minh City University of Transport (UT-HCMC), a tertiary training institution under the Ministry of Transport, is the key multi-disciplinary university for education in transport sectors in Southern Vietnam. UT-HCMC is responsible for providing the humanforce for the transport sector such as: maritime, road, railway, urban traffic system, inland waterway, airway, etc. According to the figures, up to June 2015, at UT-HCMC, there are 590 officials and lecturers including: 12 Associate Professors, 54 Doctors, 318 Masters, 170 graduates and 36 associates. Training scale: Over 15.000 students in all levels. Types of training: Regular, in-service training, second degree, international training collaboration. Maritime Science (Ship navigation, Maritime management), Transport management and operation; Control techniques and Automation; Motive power techniques (Ship techniques, Ship exploitation and maintenance, Auto mechanics); Transport construction techniques (Bridge and Tunnel construction, Urban road construction, Transport techniques and planning), Waterway and offshore construction techniques. The scientific research issue has always been taken care of and invested well by UT-HCMC. UT-HCMC has been conducting many programs, research projects, technology and science application, collaborations with national and international organizations in conducting several scientific projects to apply new technologies. As a result, the scientific research activities has deleveloped rapidly in term of the increase of the research topics. Many international scientific seminars which are the good opportunities for officials and lecturers to approach the modern technologies, the world’s achievements have been held in UT-HCMC. Several scientific projects in the state and the Ministry levels have been approved and put in the practice. The scientific research activities among students have also gained lots of encouraging achievements. The “Creative ideas of UT-HCMC’s student” contest has gradually become an annually traiditional competition and attracted many wonderful and excellent inventions and ideas. In addition, the students of UT-HCMC have also achieved many awards in several competitions such as: the ASEAN Skills competition, the Eureka Award of Ho Chi Minh City, the Vifotec in state level, the national Olympic contests. UT-HCMC has always actively promoting the international relations with foreign organizations. UT-HCMC has considered the international collaborations the key in order to attract the international investments for education, teachnology transfer and reformation activities. Global Maritime Education and Training Association (GLOBALMET). UT-HCMC is one of the 20 chosen universities in Viet Nam to be tested in university education quality by the Ministry of Eduation and Training. And UT-HCMC has successfully passed this test. 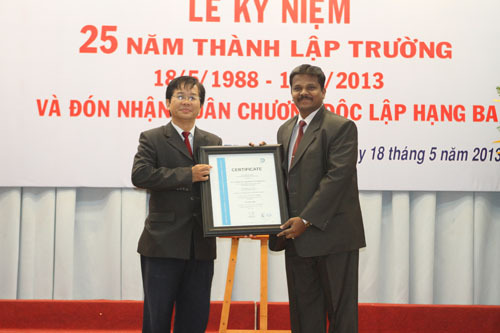 From the month of March 2012, UT-HCMC has designed and applied the ISO 9001:2008 in university education quality management system.